Before Andrews University became the largest Christian university or college in the state of Michigan it was opened as Battle Creek College. Long before Battle Creek College granted its first degrees in 1879 it closed and reopened several times. The school needed a leader who could maximize the gifts of the faculty. Ellen and James White were among the strongest supporters of the Battle Creek College (Greenleaf, 2005). Understanding the significance of the teacher Mrs. White wrote, “No cheap cast of mind should be placed in our church schools. The very best is required in educating and molding the human mind,” (White, 1900, p. 40). Additionally, she stated that, “No haphazard work must be done in the appointment of teachers” (White, 1900, p. 40). While teaching in a church school, the teacher is serving in the largest evangelistic field that is touched on a daily basis. This renders the teacher a missionary, co-laboring with the pastor for the souls of the children and their families. Jesus said that the “the laborer is worthy of his hire” (Luke 10:7). No system should exist which underpays those who work with our children, but a haphazard system which allows inequality in salary for the same work must not exist. Whereas many locally funded teachers work for much less than their counterparts, there are exceptions. After graduating from Andrews University Faith spent four years in the mission field. She served as teacher, administrator, and mentor. When she returned to the United States Faith accepted a position in a combination classroom. Creative, innovative and a teacher leader, Faith creates a learning environment that is rigorous but fun. While Faith’s position is locally funded, the school and church pay her full salary and the same benefits as her fellow conference teachers. Her school guarantees equity in employment for all teachers at the school. This investment is a collective commitment to a professional that they want to keep. Ballou & Podgursky (1997) found that teachers in private schools serve with a mission in mind. 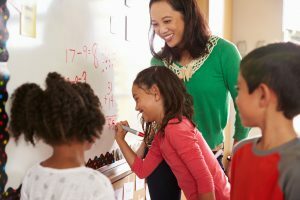 When compared to public school teachers, private school teachers perceive that parents and administration are more supportive, possibly contributing to strong and more positive attitudes towards school. This study confirms that teacher performance and self-efficacy are not necessarily tied to financial compensation, yet the median salary of the private school teachers was higher than the public school teachers surveyed. Education officials around the United States experience challenges attracting and retaining quality teachers (US Gov, 2000). For this reason many public school districts provide higher salaries for beginning teachers, attempting to lure them away from other industries, to fulfill the vacancies resulting from burgeoning school enrollments throughout the country. Unless all church school systems practice equity in employment, critical vacancies might result as qualified and creative teachers are forced to find employment elsewhere to care for their families. At the General Conference Session of 1922 it was voted for, “the conference management to endeavor in every possible way to remove our elementary teachers from embarrassments arising from irregularities in the payment of salaries and undue hindering local influences, thus stabilizing and making permanent our elementary school work” (SDA, 1922). In short, in order for church schools to thrive there must be equity in salary and benefits for all employees. This was true in 1922 and it is still true today. Greenleaf, F. (2005). In Passion for the World: A History of Seventh-day Adventist Education, Nampa, Idaho: Pacific Press Publishing Association. Seventh-day Adventist General Conference Session 1922, archives. US Department of Education National Center for Education Statistics (March 2000). White, E. G. (July 1900). The Advocate, Vol 2, No. 7, p. 40.